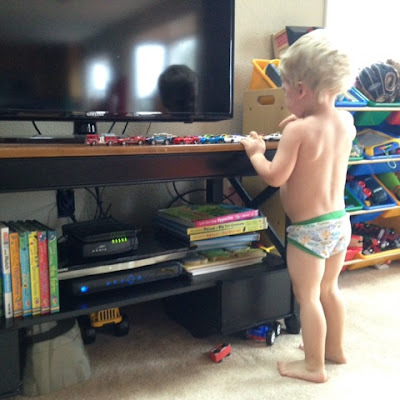 Warning: This post is allllll about potty training. Stop reading if you don't want to hear about my kid's bodily functions. I'm writing this mainly so I can document progress and have something to look back on when we go down the potty training road with Zoey. Cam woke up with a pretty wet pull up so I was glad we went that route. No telling how many times I would have been up and down to help him and/or change his sheets - and let's be honest... I'm already up enough times with Zo Zo. Part of my strategy has been to keep Cam as engaged and entertained as possible so it's easy for him to recognize that he needs to go to potty, tell us, stop what he's doing, and go. On a side (and personal) note... This sounds awful but I have really loved how this process has forced me to be incredibly attentive to him. It's not that I don't pay attention to him - because I absolutely do, but a lot of times I'm paying attention to him and interacting with him while trying to do some thing else (or sometimes multiple things). The past two days have refreshing (and exhausting) and among other things - shown me that I can stand to put some of these other things aside and focus more of my undivided attention on these babies. 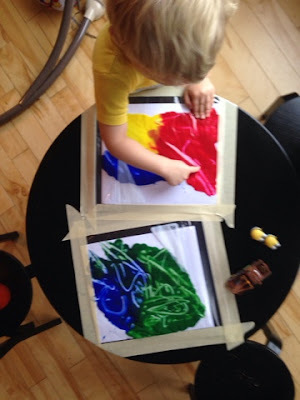 I saw a pin on Pinterest about putting paper and paint inside a Ziploc bag, taping it with masking tape to a table, and letting the child finger paint mess free! I decided to give it a try today and he was interested in each bag for about two minutes. But hey, that was four minutes of his day that he wasn't asking me to watch the iPad. The big highlight of the morning was when I was talking to my mom on the phone (half listening to her, half watching Cam like a hawk) and he said he had to go potty! He's been amazing at telling us, but some times he sits down on the potty and almost immediately says "I'm all done" even though he didn't do anything. I don't mind because although it's exhausting, I would much rather he was trying that having accidents. Anyway, while talking to my mom I set him up on the toilet and a few seconds later I hear one big plop, followed by one little plop. He frigging pooped on the potty and I was squealing with delight and pride! He immediately peed and said he was "all done," so he got three M&Ms, a sticker of his choice on his chart, and a surprise egg. A few minutes after his reward I realized he wasn't quite done peeing yet and had had a little, tiny accident, but again - he pooped on the potty and that was our focus. That little accident went on to be his only accident of the day! 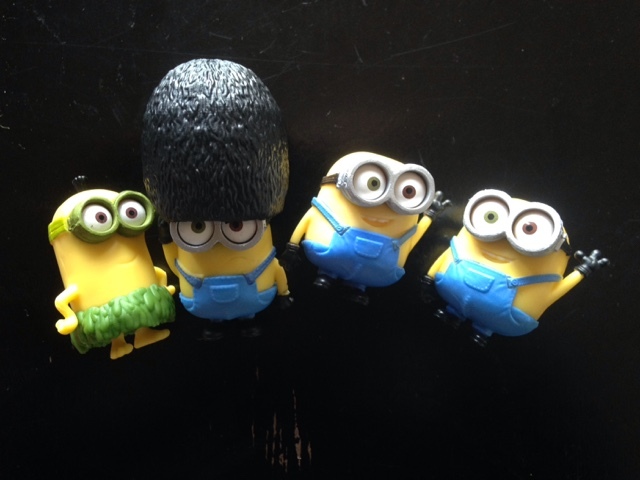 Here's an example of the small toys/prizes that I've been putting in his reward surprise eggs - little Minion figurines from The Minion Movie. 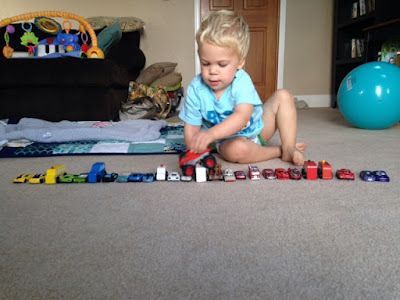 After he woke up from his nap (with only a mildly wet pull up), we broke out his matchbox cars and we lined them up so they could go "shopping." And then after we practiced counting his cars and sorting them by colors, Cam was happy to (pretend) demolish/destruct the cars with this monster truck. At bedtime he was really resisting wearing the pull up and just wanted to wear his undies, but again tonight I feel like it's in all of our best interests to wear the pull ups just for a little bit. I'll re-evaluate if he continues to do well and resist. He's a hard little sleeper and I just cannot see him waking up in the middle of the night to pee. Today I probably said the phrases "Tell Mommy when you have to go potty!" "Are you dry?!" and "You're such a big boy!" about 300 times. Each. I mean - I'm annoying myself at this point but I really think it's helping him be successful. So, I'll continue to annoy myself (and him, no doubt) for another day or two. Tomorrow will be Day Three and I am so excited and proud of him. It really seems like it's "clicking" for him and I hope tomorrow is another successful day. I know, I know. You can't wait for Day Three either.